Summer is on its way, so for most of you, that means vacation time! Yippie! 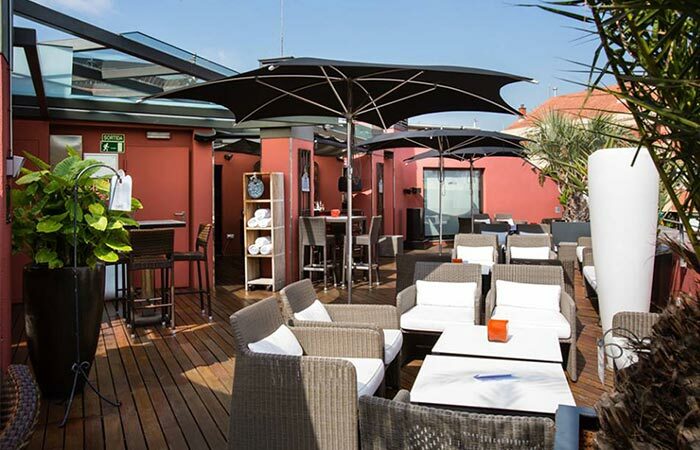 Ditch those closed shoes, long sleeves and put on the sandals, shorts, sunglasses and head out for a drink and view at one of Barcelona’s best rooftop terraces the next time you’re in the city. Known as a city of cultural diversity and packed full of history, Barcelona is the best destination if you only have time for one stop and really want to feel the vibe of a European city; it has everything you would want. 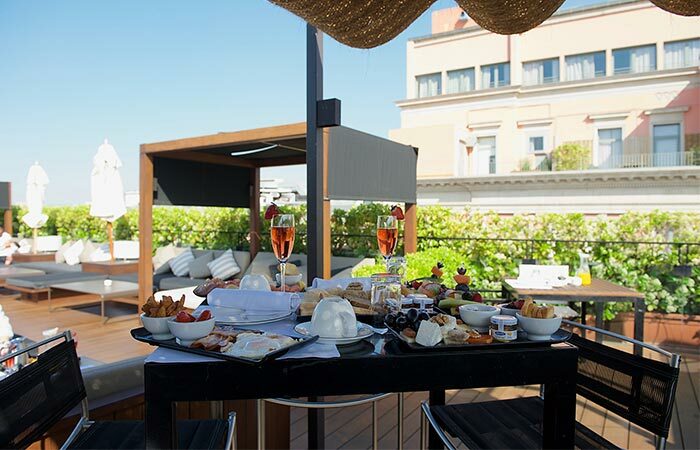 Since it’s heating up here in Barcelona there’s no better way to enjoy the hot sun than with a relaxing beverage on a rooftop terrace but with so many choices it’s hard to decide which are the best rooftop terraces in Barcelona worth visiting. 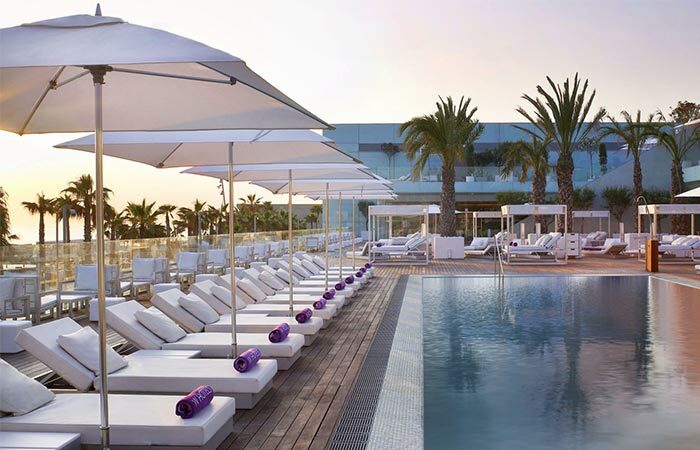 Rest assured, we’ve done the dirty work for you and have put on our walking shoes, well heels rather as some places do have a strict dress code, and went out on foot in search of the best rooftop terraces in Barcelona. What we found is that there are a lot more out there than you’d expect, but not all compare equally. 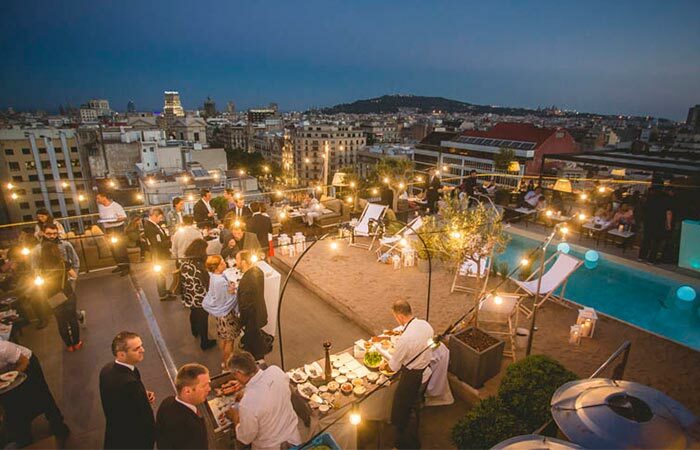 We’ll share with you our top 10 picks for the best rooftop terraces in Barcelona and follow it up with all the rest in case you feel like venturing out and seeing them all. The vibe of the terrace is what’s the most important and in our opinion is the result of a combination of factors including music, seating, space and privacy. If there’s no view, the vibe of the terrace needs to make up for it. In most cases, people head up to the rooftop terrace to enjoy a view therefore if there isn’t one, you may loose a potential customer who will be back down the lift as quickly as they came up. No one wants to travel far to enjoy a rooftop beverage; many people base their dining and drinking spots on the location they have which is why in our list, we’ve given you the best places all within close proximity to the centre of Barcelona. Many rooftop terraces are exclusively available for hotel guests or only open to the public during limited hours. It’s important to call directly to confirm the hours to ensure no private functions are taking place. If the service is crap, it’s highly likely that you won’t return especially if you’re paying a hefty amount to enjoy a drink on a rooftop terrace. Although no one wants to pay a fortune just for a drink and a view, price isn’t always super important when you’re treating yourself. 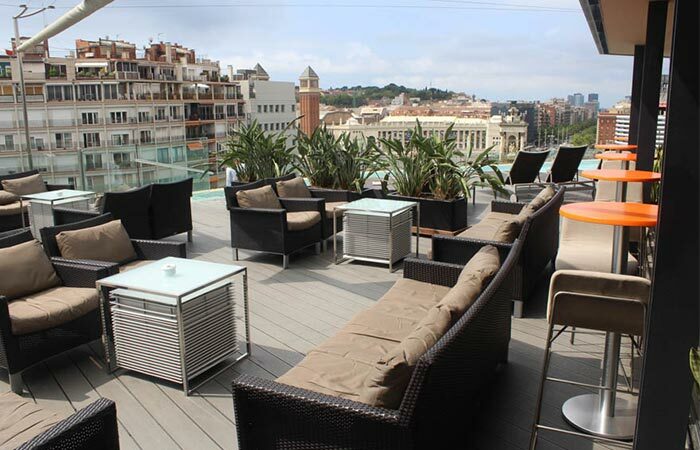 What we’ve found is that the majority of the rooftop terraces in Barcelona are reasonably priced. Drinks are similarily priced to those in some of the more expensive areas in Barcelona such as El Born, Las Ramblas, Plaza Cataluña and Plaza Rieal just to name a few. Topping our list, La Isabela Terrace has it all. You can find this gem in the centre of all the action, right on Las Ramblas which makes it a great escape amidst all the hustle and bustle. When you enter Hotel 1898, you’re sent back in time immediately as you pass through a small spinning doorway that looks like it’s out of a Hollywood movie. Take a walk through the long entrance and you’re greeted by dashing lads all decked out in their old fashion yet sophisticated suits. Once on the top floor you enter another world and step into modern chic. A friendly member of staff is there to greet and seat you in one of the many varied areas around their pretty close to 360 degree terrace. La Isabela offers atmosphere for all, whether you’re looking for a spot to have a romantic late night drink with your significant other or if you want to enjoy a casual cocktail with friends. At the terrace of Barcelo Ravel, you’ll enjoy a full 360 degree view of the city. This is a terrace that mainly has high cocktail tables with a combination of lounge furniture so whatever your comfort, or whomever you’re with, you can feel relaxed here. Every weekend, Terrace 360 holds live music nights, starting around 20:00; come early to avoid disappointment. What’s so great about this spot is that it’s located in an area that many people shy away from, Barrio Raval, as they see it as more of the grungy side of the city but let me tell you, don’t run from this spot! Ever wanted to feel like a celebrity? Well, here’s the place to go! 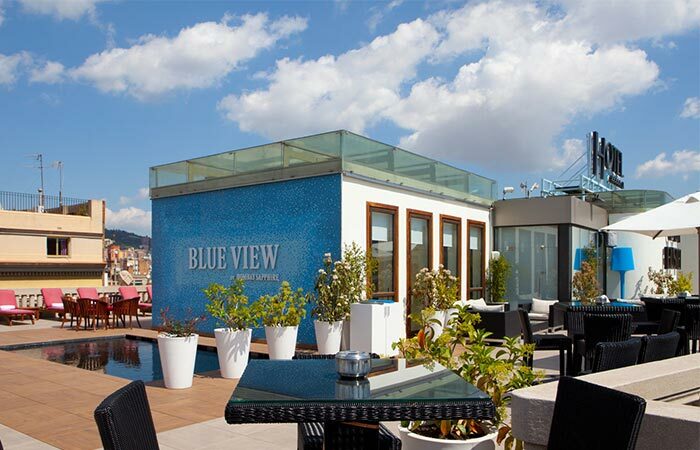 There’s no better rooftop terrace than La Dolce Vitae that we’ve visited here in Barcelona. The customer service is incredible and we’ll tell you why; step out of the lift and take your immediate left, your celebrity experience is about to begin. The hostess who greets you, takes you on a small tour of the terrace, if it’s your first time, and points out the main landmarks which can be seen from the terrace at La Dolce Vitae. Friendly, extremely attentive yet non intrusive, this is somewhere you’ll want to check out the next time you’re looking to treat yourself. Stop by La Dolce Vitae for a classy late night drink or if you fancy an afternoon aperitif. The terrace at the Magestic Hotel also hosts music nights; be sure to call ahead to confirm! First Impressions: Top notch service!!!! Can’t rave enough. Price: Most expensive out of our entire list of top 10, a cocktail could set you back up to 20 euros. Take it from someone who hangs onto her purse strings, the money is worth the experience here. Here’s a terrace that hasn’t made it on any list I’ve managed to scrummage up and frankly I can’t understand why. 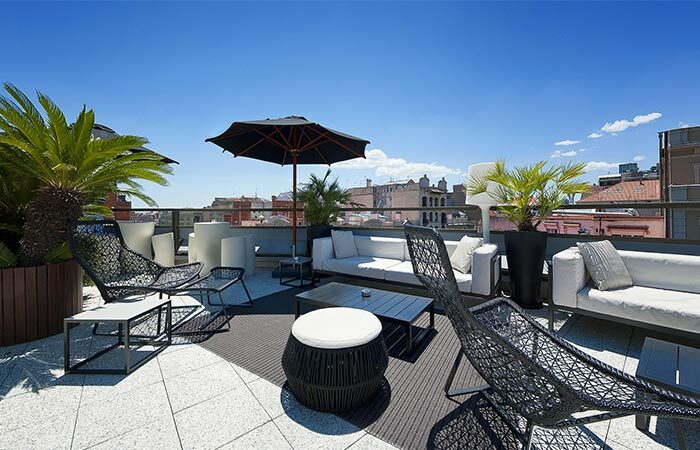 Watch out other rooftops in Barcelona, this terrace will blow you out of the water with their prices! Come up here for a 2 euro coffee or 4 euro glass of wine. Although there isn’t so much lounge furniture, there is plenty of cafe style seating to accommodate a crowd. With an almost full wrap around terrace, enjoy good chilled out vibes, with a great view, all without breaking the bank. Atmosphere: Best for a late morning coffee or relaxing afternoon drink in quiet surroundings. First Impressions: Not so service oriented, didn’t welcome on arrival. Price: You won’t find a cheaper drink on a rooftop other than here! Bring a fiver and you can satisfy you’re thirst for most drinks on the menu, cocktails excluded. If you’re interested in discovering a hidden gem, you’ll find that La Terraza at the Villa Emilia is a nice escape, with a modern design and unique furniture. It is set off any of the main roads most would be familiar with but yet still very near Plaza España. During the week, the terrace is rather calm which makes it a great place to find some tranquility. For more action, visit on Thursday and Saturday when La Terraza plays host to their popular BBQ events. Not expecting much of this hotel terrace, from the look of the outside of the building, it does offer a bit of a surprise. The view isn’t so good, probably one of the least outstanding on our list however if you’re looking for somewhere to kick back and chill this may be a good spot for you. Come by for one of the DJ sessions every Thursday, Friday, and Saturday from 21h to 01h if you’re into some good vibes. You won’t find the best view or most incredible terrace here but if you want somewhere where you can relax without a pretentious feeling lurking in the air, you’ll find that here. The staff make you feel comfortable and are available to ensure you are enjoying your time. For a central location, relatively inexpensive drinks, and causal atmosphere, Hotel B’s B-Bar Terrace won’t disappoint. First Impressions: Incredible view unmatched to any other. Waiting staff are heavily customer focused. 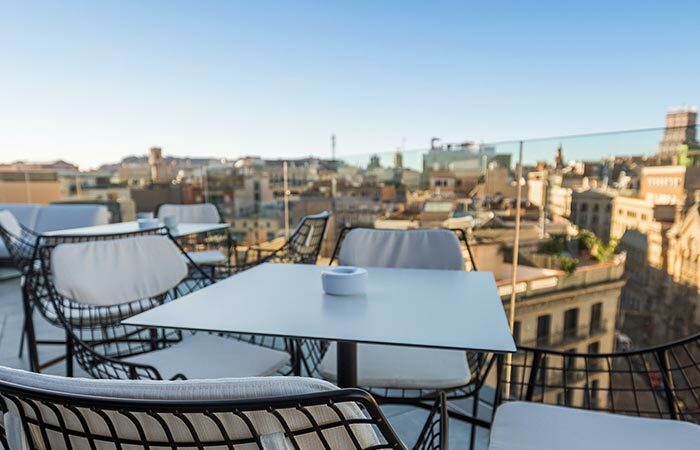 The terrace at Hotel Casa Fuster boasts an incredible view of the whole of Passeig de Gracia. 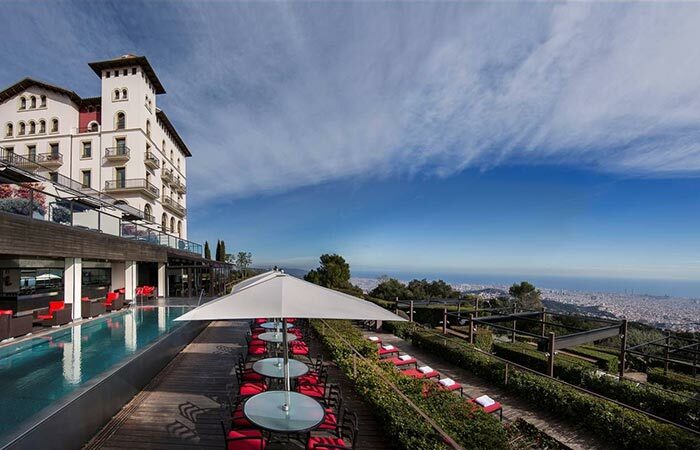 Situated at the very top of the famous street, just outside of the neighbourhood of Gracia. You can see why the drinks aren’t cheap; you’re definitely paying for a 5 star view. Although a cup of coffee with set you back nearly 6 euros and a cocktail double that if not more, the comfortable casual atmosphere offers a bit of peace outside the hustle and bustle below which is worth the payment. If you’re looking for a treat you can pop in here. The service is not like in the Dolce Vitae for example, which is why this terrace isn’t as high on our list, but for a chilled out, left alone feel, stop in for a drink here. Atmosphere: Upper class casual. Best for an afternoon/early evening drink. Options for various seating, raised tables, lounge furniture, pool side seating. First Impressions: Staff is friendly however they are not focused on attentiveness. Throughout our list, we’ve been covering rooftop terraces that are at the very top of the buildings. At Hotel W, their rooftop terrace, Eclipse, although with a high view of the city, doesn’t fit the bill when it comes to our criteria for a great terrace, plus it’s not in the open air. 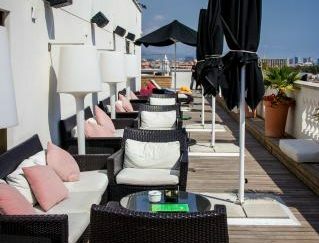 The W does have another terrace however it is not a true rooftop terrace and although it only overs a vantage point over the chiringuitos on the beach and a view of the action around it’s still a very popular spot which is why we’ve added it. Don’t miss the Sunday evening parties which start up once summer hits. Atmosphere: Best during the late afternoon, feel the beach vibe action! We’d like to point out, that if you’re not a hotel guest, out of courtesy we recommend to go first to reception and ask for the terrace there to ensure no private function is taking place. The majority of properties will not update their websites with daily time changes or special event closures. Note: All hours of operation listed in our Top 10 rooftop terraces were relevant at the time this article was published. If you have any doubts on opening and closing times, please contact the terraces directly. Also, reservations may be required depending on the day and size of group, for any doubts, call or email from the contact provided. Although not the best rooftop terraces here in Barcelona, we’d like to be objective and include the other spots we checked out while compiling our list. 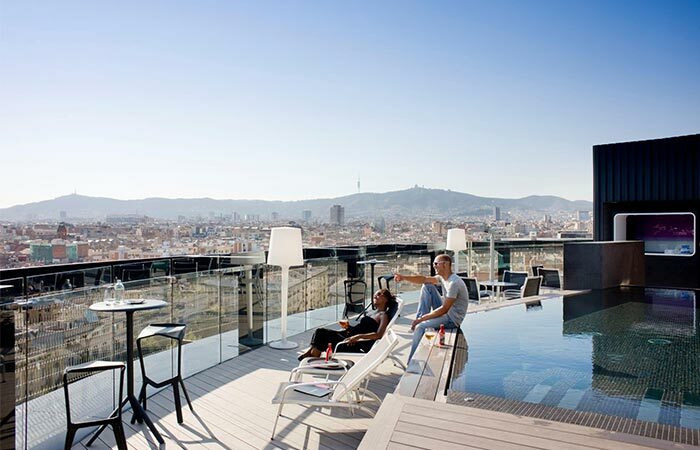 Check back often since we plan to add more to the list as we continue to visit more rooftop terraces in Barcelona!!!! Note: Hotels such as the Ohla Hotel and El Palauet both denied access to the terrace for nonresidence and were very unaccommodating with providing information as to public hours and availability. Would not recommend these properties! !